Tired of the way some saddle racks loose their shape? Now is the time to add our new saddle rack to your tack rook. Racks: 1 1/2" 14 ga. tubing with ½” steel rods to hold saddle shape. Winkel post drivers are built to last and feature large diameter handles for easier grip & balance. 2 1/2"dia. x 28" -22lbs. 3" dia. x 28" - 27lbs. Rugged and heavy...the best around. This tool gets the job done! A great special occasion gift or addition to any home. Ball bearing glider suspension with white plastic 2 x 4’s for the seat. 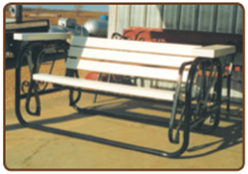 Outer frame is constructed of 1.66 x 14 ga. steel, with seat frame of 1" x 14 ga. square. Armrests of 2 x 6 complete with white plastic drink holders. Easy, comfortable gliding and very portable. Primed and then painted black.